“Her skin, though perfectly smooth, was almost of a copper hue. Her eyes were set obliquely in her head, but they were magnificent and large. Her lips, a little full, but beautifully shaped, revealed a set of teeth as white as newly skinned almonds. Her hair—a trifle coarse, perhaps—was black, with blue lights on it like a raven’s wing, long and glossy. In this poignant depiction, French author Prosper Merimee describes Senorita Carmen, protagonist and title-giver of his well known novella, published in 1845. Living far from refined Parisian life, Carmen is a Spanish gypsy girl; one who has made her way to George Bizet’s opera with the same name (premiering in 1875) followed by dozens of stage and then film adaptations of Merimee’s text. For a century and a half, Carmen has become one of the most famous Spanish heroines of all time, attracting the attention of all viewers. To many, she symbolises love and passion, enchants us with her charm, sensuality, fierceness and passion in exactly the same way as she lured Don Jose, a naïve officer, her lover-turned-assassin. Carmen is a story that invites music, rhythm, colour, Spanish flair and passion; above all, it is a rich soil for creativity; and the many adaptations of the story have turned it into a guaranteed audience magnet. No wonder the audience started buzzing the minute the Cairo Opera House announced the arrival of Ballet Carmen by the Antonio Gades Company. The performance was staged to a full house on four consecutive evenings between 25 and 28 October. While to some, “Carmen” was the keyword for spending an evening at the opera, others also recognised name of the famed Spanish company, which has visited Egypt before, its last performance in Cairo having taken place in 2010, and whose international reputation is strong enough to fill halls anywhere. 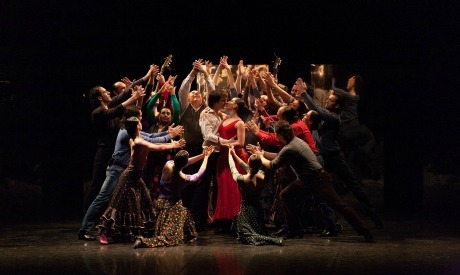 Ballet Carmen’s plot, choreography and lighting are the work of the late master flamenco dancer and choreographer Antonio Gades, with Carlos Saura. It premiered in 1983, as part of a dance-theatre trilogy that also incorporates Blood Wedding and Flamenco Suite choreographed by Gades. International critics have written a lot about Gades: his rise to fame and his company; testimonies to the power of the choreographer and his work was also tackled on the pages of Al Ahram Weekly, after each of the company’s visits to Egypt. Weekly’s Lubna Abdel-Aziz, for example, summed up the life and career of “the greatest flamenco dancer in the history of Spain,” providing an extended look at flamenco as an art form, in her 4 August 2004 obituary of Gades, published two weeks after the artist’s passing. Certainly Gades’ masterpiece, over three decades after its premiere in France, continues to enthral the audience. Dealing with a famous work such as Carmen can be a challenge to any creative mind. By the time Gades thought of looking into Carmen, Merimee’s text and Bizet’s libretto had already seen hundreds of adaptations. In fact, the idea of the ballet-theatrical version of Carmen came to Gades around the same time as Carlos Saura filmed his flamenco-infused movie based on the novella. The film’s success surprised and encouraged Gades and Saura to take the idea further on stage. As one critic put it, Merimee took Carmen to France but Gades brought her back to Spain. Indeed, maybe Carmen belongs to the land suffused with the passion and power of classical flamenco, where the truthful spontaneity of gypsy culture is brilliantly fused with professional artistic expressions. Or maybe this format allows the creators to find in Carmen values that French or other international artists tend to overlook, often presenting the heroine in a rather superficial way? As for Gades, Carmen is not just a frivolous woman who seduces men weakened by her beauty. Strong-minded and proud, Carmen is a representative of her community: honest about her emotions, true to love and to people. Surrounded by a cruel world where social injustice, moral sins and lawlessness reign, Carmen preserves her values and unique nobility, refusing to belong to anyone – even Jose – and she therefore dies at his hands. Gades uses Merimee’s text as the thematic backbone of his work. He incorporates well known segments from the recording of Bizet’s Carmen (recorded by renowned Orchestre de la Suisse Romande) as well as Spanish music with live musicians on stage (two guitarists and three cantaores or flamenco singers). While the performance begins with a fragment of Bizet’s music, the curtain opens to reveal a studio where the flamenco dancers are rehearsing. As the plot progresses, the characters in the studio find their way to Carmen’s plot, wherein Esmeralda Manzanas in her iconic red dress becomes Carmen while either Migel Lara or Alvaro Madrid (depending on the performance) take the role of Don Jose. The story becomes a fusion of strong rhythm, music and classical dance. 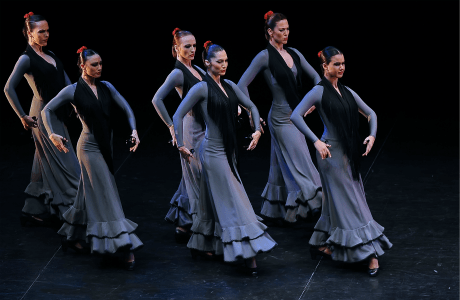 Besides music, however, Gades introduces large segments of silence: striking scenes in which the breath of each character and the rustle of the flamenco skirts are the only sounds that accompany the dancers. But the performance is not just a simple depiction of a community in the studio aiming at portraying Carmen. As they take us inside the story, they begin to live within the plot while the plot dramatises their lives. In this interaction between reality and Merimee’s tale, many secondary characters sustain an ability to move in and out of Carmen as a story, but for Carmen and Jose, the dramatic content seems too powerful to let them return to the reality of the studio. Their connection becomes stronger as the plot progresses, from the first and extremely poignant pas de deux they perform mostly to complete silence, to many scenes in which their passion escalates leading to Carmen’s inevitable death. There are moments when the gypsies, or dancers in the studio, try to bring Carmen back to reality, but to no avail. Aren’t they themselves equally aware of their own subconscious hovering between reality and the dream of which Carmen and Jose have become protagonists? It is in this constant and never completely defined fluctuation from story to studio and back that the viewer follows the art of flamenco, the sensuality of the artists and the tragedy of Carmen. It is also in this fluidity of impalpable transformations of reality, that the studio-husband (Miguel Angel Rojas) of Carmen enters into a quarrel with Merimee’s Jose and is killed by him. This tragic event shakes the studio community but does not awaken Carmen, who continues her journey within the story – or rather inside her own illusion – and leaves with Jose, only to find herself attracted by a Toreador (Jairo Rodriguez) named in Bizet’s opera Escamillo, who fuels Jose’s jealousy. Gades’ Carmen is a multilayered structure of realities, a base on which he builds up the nobility and deep emotion of the gypsy girl from Seville. Together with Saura, he manages to extract many captivating colours out of the story, with the music embraced by very simple scenography. Throughout the whole performance, the stage is almost empty, filled mostly with chairs and a few body length, imperfect mirrors. While mirrors are an expected element of a rehearsal room’s design, in this performance they also allow the characters to find their own skewed reflections. Is it an invitation for them to search for their souls and true identities, whether in our temporal reality or in Merimee’s story? Gades leaves this to the viewer’s interpretation. Undeniably, the thematic architecture of the performance is emphasised by the choice of music, the choreography and their impeccable execution by the dancers. Whether tapping the floor with their feet in perfect unison, or presenting the captivating palmas (rhythmic hand clapping), a group of over 20 dancers delivers; and whether duets or trios engage in a dance of classic flamenco, the whole performance strikes the viewer with a sense of virtuosity paralleled by tamed spontaneity. The powerful creative vision is the director’s hallmark and perfection is the dancers’ emblem. Everyone completes the image, even the onstage musicians are a natural part of the crowd. In this creative fiesta, everything – music, movement, sound and silence – has its place, reason and function. The narrative articulation of Gades’ story brings Carmen into new depths, on both the thematic and creative levels. No wonder the work has been celebrated for over three decades and continues to tour the globe, incorporating new generations of dancers and, most importantly, keeping this wonderful artistic legacy alive – an eternal testimony to Gades’ greatness. The company is now “directed by Stella Arauzo, who for many years was Gades’ partner onstage and technically by Dominique You, his right hand and illuminating much of his works; the company is now composed of people who worked a long time with the Alicante teacher, helping new members in the internalisation of its aesthetics and ethical philosophy applied to dance,” so we read in the programme notes accompanying Cairo’s performance. Attending Antonio Gades Company’s performance in Egypt is a rare privilege, an important event in the repertoire of the Cairo Opera House which we will remember, until the Spanish troupe’s next visit.